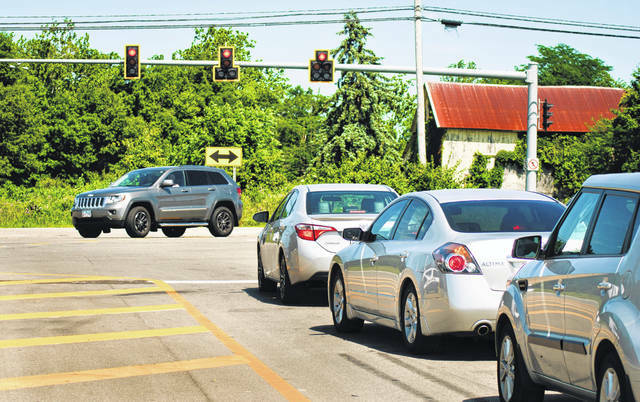 According to Delaware County Chief Deputy Engineer Rob Riley, pending all the ODOT approvals that will be necessary on U.S. Route 23, the engineer’s office hopes to start construction next fall on the Home Road extension, which could open as soon as the summer of 2020. The $954,965 project will extend Home Road across U.S. 23 to a new intersection at Green Meadows Drive. Currently, Home Road ends on the west side of U.S. 23 where motorists only have the option to turn left or right at intersection shown in the photo. The Delaware County Engineer’s Office has negotiated a contract with HDR Engineering of Columbus for the final design and construction of an extension of Home Road east from its current terminus on the west side of U.S. Route 23 to create an intersection with Green Meadows Drive. The engineer’s office hopes the extension project, which will stretch across one of the busiest highways in the county, will be completed by the summer of 2020. “Pending all the ODOT (Ohio Department of Transportation) approvals that would be necessary on U.S. 23, we would hope to be under construction next fall with the road potentially opening in the summer of 2020,” said Rob Riley, chief deputy engineer. The contract, not to exceed the cost of $954,965 without the prior approval, was approved by Delaware County commissioners on July 2. “The extension of Home Road east of U.S. 23 is a project that we’ve been working on for some time,” Riley said. He added the engineer’s office has been working on the beginning stages of the project since 2014 with HDR Engineering starting with the preliminary designing of the project. “We have been working with the developer for some time, and we believe we have the makings of an agreement to contribute to the cost of this project,” Riley said. Riley told commissioners that the engineer’s office was asking for a modification to the current contract with the engineering company. He said that HDR Engineering had been contracted in 2014 for the preliminary design of the project, and the company would like to include the work for the final construction design plans to the original contract. According to the contract details contained in the commissioners’ journal of the meeting, the original contract for the preliminary design was for $238,930. The modification to include the final design and construction is $716,035, bringing the total of the contract to $954,965. “Our expectation is that these plans will be done in about a year, maybe a little less than a year since much of the preliminary work has already been done,” Riley said. According to the contract, the extension will allow motorist to travel down Home Road and across U.S. Route 23, ending at the future intersection of Green Meadows Drive and Home Road about a 1,000 feet short of the CSX railroad tracks. This entry was tagged Commissioners, County Engineer’s Office, D. Anthony Botkin, delaware county, Home Road, Rob Rily, US 23. Bookmark the permalink.